When I decided to turn my wuxia trilogy into a visual novel series, I immediately started on it the way I begin every creative endeavor: research. I found lists of recommended visual novels and read about them, surveyed all of the visual novels sold on Steam, and purchased a few to play through myself. To my surprise, I found the visual novel industry is seriously disappointing. 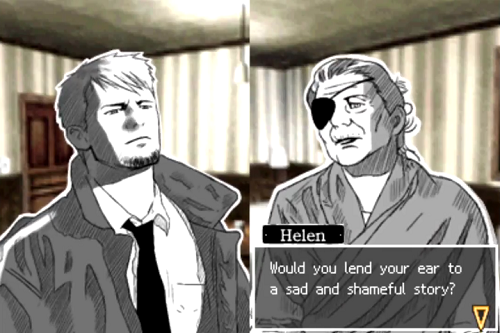 The visual novel medium has MASSIVE potential to be awesome. But instead of capitalizing on that potential, developers put out mediocre games that are less innovative and engaging than static printed graphic and prose novels. Disappointment #1: They're written as if they're plain old books. The whole point of visual novels is that they're visual. They're supposed to use both pictures and words to convey a story more effectively than either can alone. 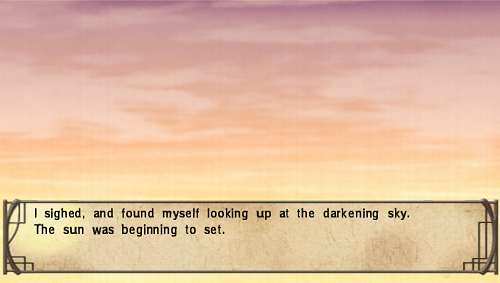 Yet many visual novels are nothing more than plain, boring old books with some pretty pictures. For example, the words describe scenes that pictures already show. Or the words describe scenes that pictures should have shown. Not only do these games fail to show their stories with pictures, they don't even show them with words. They tell, tell, tell. 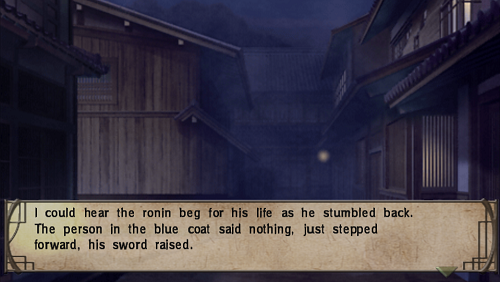 In Hakuoki, the writers don't show a boy's changing feelings towards the heroine through his dialog and actions. 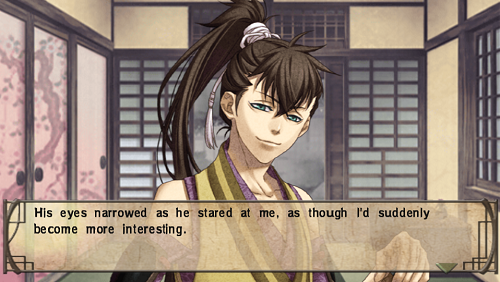 Instead, the heroine helpfully informs the audience that he seems interested in her. And instead of showing the audience the heroine is tense through her tone and nervous habits, the heroine simply says, "I found myself depressed and tense." Disappointment #2: They suffer from Oprah Syndrome. Sometimes the telling takes a different form. In Hotel Dusk, the script shows at the sentence and scene levels, but it tells at the structural level. The game itself doesn't have any plot to speak of, and all of the drama comes from characters literally standing still and telling their stories in the past tense. In "dating sim" type visual novels, the player character chooses which hot guy or gal to pursue from a harem of potential love interests. Each romance typically ends with a climactic scene of the chosen partner delivering a teary-eyed confession about a difficult childhood, a tragic loss, and/or trauma-induced insecurities...and this is the full extent of the "story." 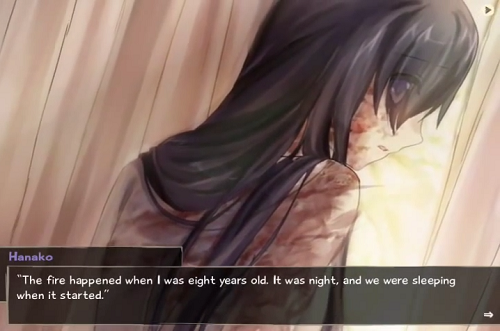 In other words, the stories in these visual novels play out like episodes of Oprah. The affable protagonist talks to the audience for a bit, then interviews some people who sit on a sound stage and bare their souls. Why is Oprah Syndrome so common in visual novels? I have a few theories. Most visual novels were made in Japan. Most Americans have never heard of visual novels. The medium is much more popular in East Asia, particularly in Japan. If you Google "best visual novels," all of the results will be lists of exclusively Asian titles with art in a stereotypical anime style. East Asian storytelling is different from Western storytelling in many ways. In American TV shows, scenes are zippy and full of motion. The most dramatic moments are short and exciting, with a lot of shouting, passionate kissing, and/or gun-waving. In Japanese, Chinese, and Korean TV shows, there are few guns and very few kisses (maybe one or two per series). Instead, the characters do a lot of talking. The most dramatic scenes are often long emotional monologues by actors literally sitting still on a sound stage. When Sweetie and I watched Father Is Strange over the summer, we groaned whenever we saw Father and Mother sit down together, because we knew the next five minutes would be yet another discussion of their feelings. Most visual novels were made by small teams with tiny budgets. Big developers with money don't make visual novels. They make epic space operas, NFL simulators, deliberately addictive mobile games, and zombie apocalypse shoot 'em ups. Visual novels are made by quirky small studios, or even by lone hobbyists with big dreams. Words are cheap and easy to type. Art is expensive and requires a lot of time and effort to create. So it's tempting for a small developer with a limited budget to write a ton of words illustrated by a few static pictures of characters with different facial expressions. Quality storytelling and fully illustrated scenes would require much more work, which costs money if you need to hire someone else to do it. Visual novel protagonists are usually blank slates. Because developers want players to immerse themselves in the games, protagonists often have little to no character. They're stock characters with genre-standard personalities, bare-bones life stories, and bland or outright customizeable facial features. The choice to make an "everyman" protagonist makes sense for fighting and adventure games, but it hobbles visual novels. Good stories need active protagonists with goals to chase and flaws to overcome. If you create a totally blank protagonist, all of the drama has to come from the other characters. Then you end up with Oprah episodes. Disappointment #3: The stories are purely "on rails." In theory, visual novels offer players the opportunity to explore story worlds and shape them through their choices. But in reality, many visual novels out there are very linear and don't allow players to play. In some games, player choice is a halfhearted illusion. You can run around the map all you want, but nothing meaningful will happen until you stumble onto the one and only story path. For example, in Hotel Dusk you can roam freely through the hotel in every chapter, but the plot will progress only if you move to certain places, pick up certain items, and/or find certain people to talk to. I wasted a lot of time skulking up and down empty halls, knocking on all the doors, trying to figure out what the game wanted me to do to progress. Eventually I gave up playing in earnest and found a walk-through that would tell me where I had to go to trigger the next scripted conversation. In "branching storyline" type games, players are often sent down rigid paths based on one or two choices. For a hypothetical example, if the player chooses to bake cookies with Vampire A instead of planting flowers with Vampire B, she is then destined to marry Vampire A and can't even get to know Vampire B for the rest of that play-through. In the most frustrating games, innocuous choices force players onto dead-end branches, and there's nothing they can do about it. 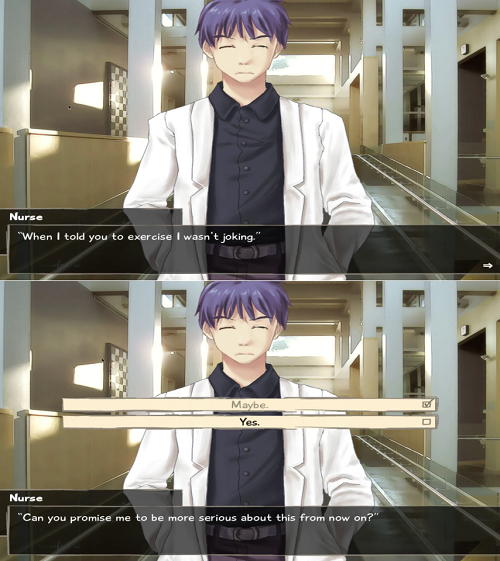 E.g., merely choosing to go to the kitchen instead of the garden will seal the unwitting player's fate with Vampire A. I will be forever sour about the time I innocently agreed with the school nurse's suggestion to get more exercise in Katawa Shoujo, unaware that I was committing myself to a branch of no return. Does this look like a life-defining choice to you?! My ideal visual novel is fun, emotionally engaging, and frustration-free, without any of the disappointments above. The protagonist should participate actively in the story. The logic for having a blank, mute protagonist doesn't apply to visual novels. In most types of games, mechanics are more important than story; players will tolerate laughable dialog and nonsensical plots as long as they have fun. 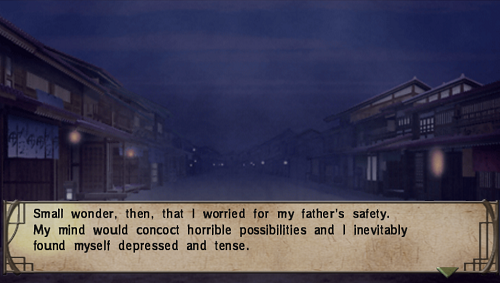 But in visual novels, the story is the fun. And to craft a fun story, you must have a protagonist who protags. The player should be able to explore the entire story in one play-through. I don't know why visual novel developers think "one bazillion unique endings!" is a strong marketing point. There's nothing fun about fast-forwarding through a game a bazillion times. It's fun to play a game once...maybe twice. After that, most people get bored and move on to something new. The standard "branching" structure of visual novels today is so stale, players don't even play them for real. They consult charts that show "How to get all bazillion endings" and abuse save files to navigate the known branches. After the first playthrough, they're probably not even reading the story. They're just collecting the endings for 100% completion. The branching formula also means players who attempt to play without a chart will most likely trigger a disappointing ending. They'll like Vampire B best, but they'll somehow end up marrying that jerk Vampire C or leaping off a cliff with that idiot Vampire F instead. If every story were accessible in one playthrough, and a player could hand a Kleenex tissue to Vampire F without consenting to leap off a cliff with him, this wouldn't be a problem. The player should be able to go anywhere and find a story waiting. Writers are accustomed to thinking of stories linearly. Plot Point A at Setting X causes Plot Point B at Setting Y, which leads inevitably to Plot Point C at Setting Z. After all, causal relationships between plot points make the difference between a story vs. stuff that happens. This poses a problem for writing visual novels, because players might want to zip straight to Setting Y instead of visiting Setting X first. That's why visual novel developers tend to force players onto frustrating "Find the Trigger Rails"—because Plot Point B at Setting Y wouldn't make any sense if Plot Point A didn't happen first. However, there are solutions other than very obvious rails. The key to creating a game that feels open, but still has a great story with a proper plot, is to write more than one story. In MMOs like Final Fantasy XI, there are many epic adventures to choose from. Once you start a storyline you do have to accomplish tasks in a certain order to progress, but you can always run off and do something else too. In modern RPGs like Xenoblade Chronicles, the main story is linear, but the experience of playing through it is very open. The player can run around to many places and find NPCs offering "side quests" that play out in mini-stories. If you offer parallel threads like this, the game won't feel like a tedious exercise in "finding the right door to knock on." Players can follow the story that starts in Setting X and ends in Setting Z, but they can also discover a story that starts in Setting Y and ends in Setting X. Going to the settings "out of order" won't be a complete waste of time. The player's choices should influence the story in a logical way. This one should be obvious, right? If a player makes a choice in a game, it should have a logical outcome. There's no reason why anyone would create a game in which actions and their effects would be totally arbitrary and nonsensical. I think writers of visual novels get so caught up in the weeds of building branches and defining "flags," they lose sight of what players will logically expect to happen when they make choices. The writers think, "We need a flag that puts the player down the Emi path. Oh, this part where the school nurse asks the hero to exercise more works, because Emi is the Sporty Spice." They don't think, "What choice would players make if they want to go down the Emi path?" To conclude, here is a short excerpt from chapter 127 of the Chinese webtoon Wo Jia Dashi Xiong Naozi You Keng, by an artist who shares my sentiments.